"This is a Greek style salad that is delicious! It is hearty enough to serve as the main course." Cook pasta in a large pot of boiling salted water until al dente. Drain and cool under cold water. Refrigerate until chilled. Prepare the dressing in a small bowl by whisking together the olive oil, lemon zest, lemon juice, walnuts, and honey. Refrigerate until chilled. 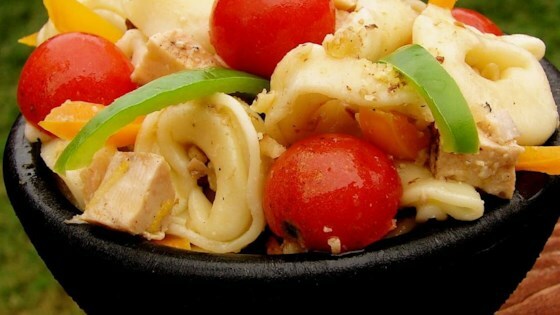 In a salad bowl, combine pasta, peppers, red onion, olives, and chicken. Add lemon dressing and feta cheese, toss and serve. Not bad but nothing special, either. Perhaps my having left walnuts out caused the recipe to be blander than it should have been. Excellent dressing on an excellent salad. Nice to have something so different and delicious. Well done. This is a nice salad to serve with summer BBQ.